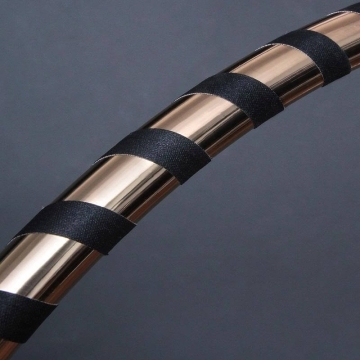 Take a look at this stunning Hula Hoop by Hoopomania to gain an impression of its elegant appearance: an attractive metallic tape in gold gives this Hoop an elegant base which is completed visually and functionally with the black grip tape. In addition to the dynamic effect of the wrapped grip tape, it helps noticeably to increase the level of adhesion so that the Hula Hoop can be easily kept up. The tire is made of a very stable HDPE tube (diameter 20 mm) with three different diameters (80, 90 or 100 cm) to choose from. In this way, you can already place the individual foundations for the best possible fit when ordering. With this functional Hula Hoop, a wide variety of athletic options will be available because thanks to the integrated snap buttons, the size can be reduced significantly. 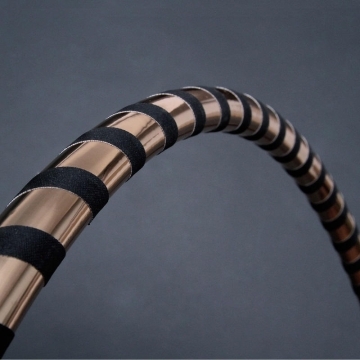 In this way, you can take the designer Hula Hoop with you anywhere and work out flexibly where you want. In terms of health, regular workouts will literally bring the entire body into the swing, leading to an improvement in posture, coordination and endurance.